Diary of a Wimpy Kid!!! He had finished reading the first 4 books and requests for the rest of the series. Instead of making straightforward all-butter buttercream that I usually do, I have made this buttercream with meringue powder simply for my curiosity and its extra holding power. It is true that the meringue powder does help giving buttercream a firmer texture and it is extremely helpful for decorating cakes that need buttercream to hold its shapes and also stay in good shapes in warmer temperatures. However, the disadvantage is that the buttercream wouldn't stay soft, smooth and creamy, developing crusty finishes if it is uncovered at room temperature. In term of holding power and texture, I reckon Italian meringue buttercream and Swiss meringue buttercream are the best. These meringue buttercream are always flawless, white, smooth, creamy and can stay in good shapes. I like to make these fanciful buttercream but not for this bake because I need to allocate more time for cake decorating. Considering all options, advantages, disadvantages and limitations, I would say that this easy buttercream with meringue powder from King Arthur Flour still works the best for this bake. 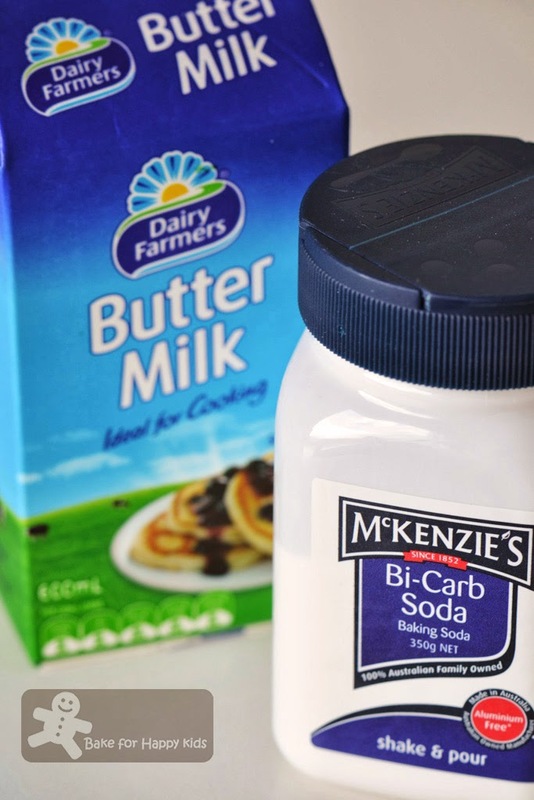 This cake requires the chemistry of buttermilk and baking soda so please do not substitute these. 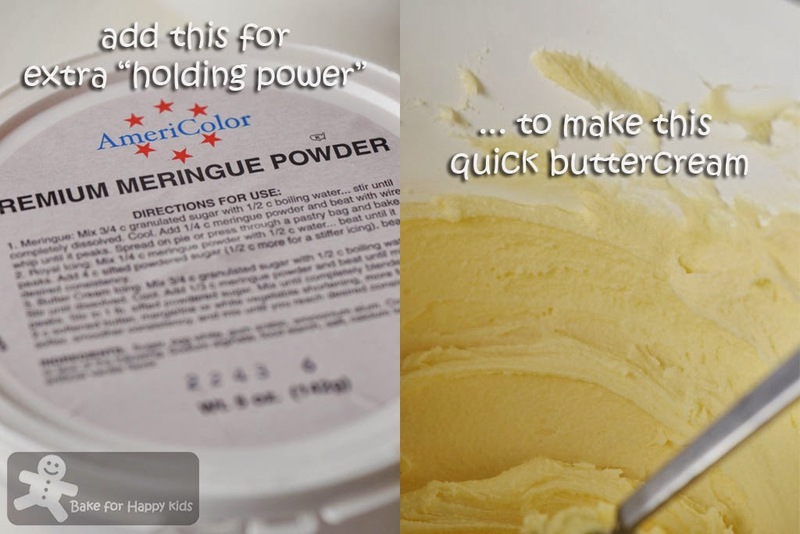 This buttercream looks and tastes like the buttercream that I usually made but with extra "holding" power. This is what I need and did to trace the title of the book on the cake. I used the edible pens to trace the title and did some drawings on the cake. Here... This is my Diary of a Wimpy Kid birthday cake. My boy is very excited and happy seeing his Diary of a Wimpy Kid birthday cake. I'm very happy too knowing that he likes this cake! Happy Birthday, Sweetie! Wish that your life is colourful, fun, fulfilling and adventurous like all the books that you have read - Love, mummy. 200g sugar - please do reduce this amount further as the sweetness for this cake is just right. Preheat oven to 350°F or 160°C fan forced.. Line baking pan with baking paper, leaving an overhang on long sides. 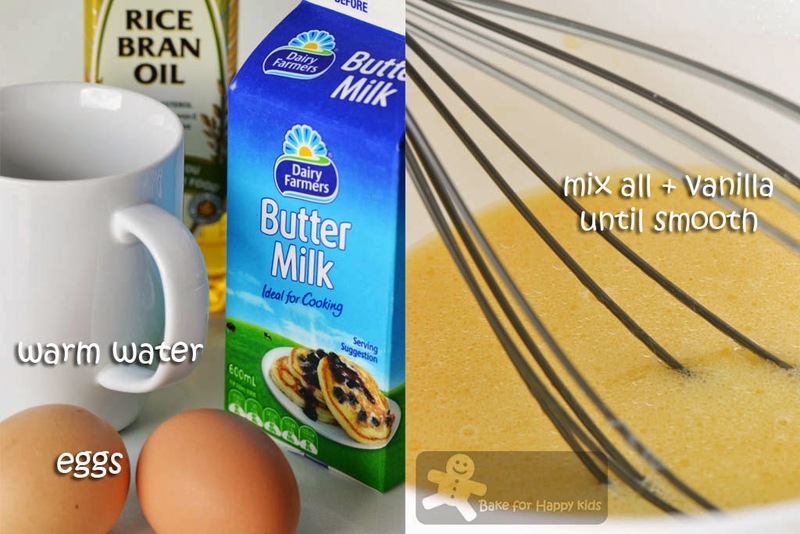 Combine eggs, buttermilk, water, oil, and vanilla and whisk the mixture until smooth. 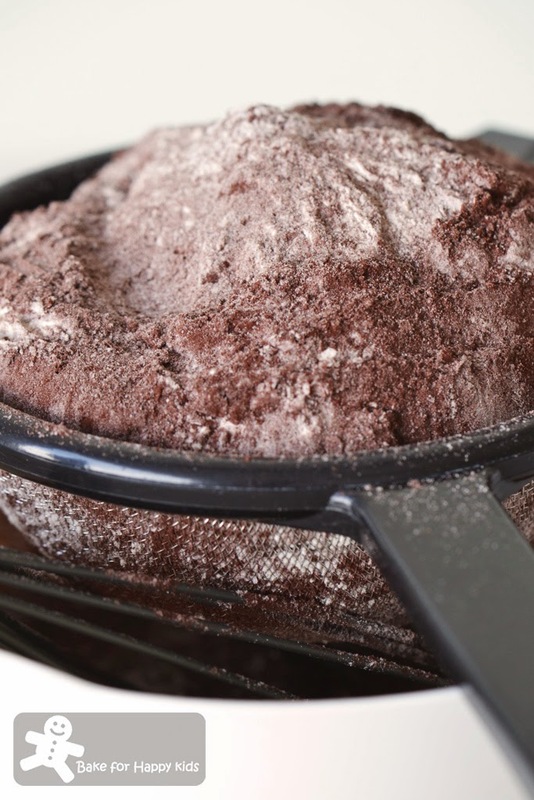 Combine cocoa powder, flour, sugar, baking soda, baking powder and salt and sift them together into the egg mixture. Pour batter into prepared pan and spread its surface evenly. Bake for 25 mins or until skewer inserted comes out clean. Let cool completely, then lift cakes from pans using the overhanging baking paper. Remove baking paper. Note: This recipe produced a large 9 x 13" inches cake which is more than half of the amount that I need to make this book cake but I made it in this size just in case of any silly mistakes. In actual fact, I didn't have to bake such a large cake. Excess cake? No worries at all! We love eating them with chocolate sauce or ganache. 1/2 tbsp meringue powder, optional, for "holding power"
Beat butter until fluffy. Beat in the salt, meringue powder, and the vanilla. Add the confectioners' or glazing sugar, 2 tablespoons of the milk, and beat well. Scrape the sides and bottom of the bowl. Adjust the consistency of the frosting as needed by adding more confectioners' sugar or milk. If you're not going to use the frosting right away, keep it at room temperature, covered, to prevent it from developing a dry crust. Lightly whisk egg white in a bowl. Gradually add 3/4 amount of icing sugar, whisking until smooth and combined. Stir in lemon juice and colouring. Keep adding the rest of icing sugar until you get your desired consistency. Store icing in a covered container until ready to use. Start by cutting the cake accordingly to the size of the book, 13 cm x 20 cm. Roll a layer of red-coloured fondant and trim it to 14 cm x 21 cm and place on the serving broad first. Then, place the cake on top of the fondant. With the cake facing you, align both the left sides of the cake and fondant. This leaves a border of fondant at the top, bottom and its right side. Spread buttercream on the top and all sides of the cake. Roll three strips of white fondant and trim to two 13 cm x 4 cm and one 20 cm x 4 cm. Briefly roll lines on these strips so the lines look like pages of the book. Place the longer strip at the right side of the cake and the other two strips on the top and bottom of the cake. 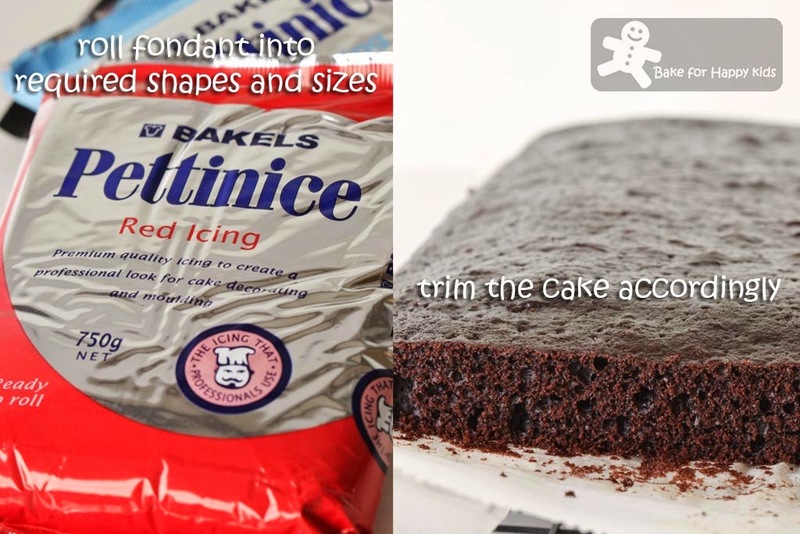 Roll another layer of red-coloured fondant and trim it to 20 cm x 20 cm. Place the rolled fondant from the left side of the cake being side of the book and slowly lay it over on the rest of the cake forming the cover of the book. Trim off any excess fondant after leveling the fondant surface on the cake. 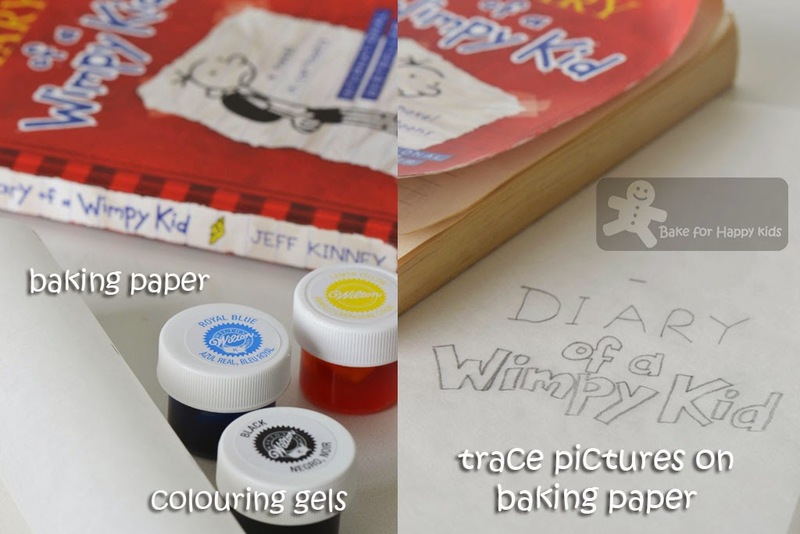 Using a baking paper and pencil, trace the title and wimpy kid picture of the book in two separated baking paper. Using an edible pen, trace the title first on the back of the traced paper and place the traced markings on the position of the cake where the title is. Gently press the pen marking on the fondant surface. Using yellow-coloured, blue-coloured and white royal icing, trace the marking on the fondant to replicate the titles on the cake. Roll a thin layer of white fondant about 12 x 12 cm. Using a blue edible pen, draw blue lines on it. Using a black edible pen, trace the wimpy kid picture on the back of the traced paper and place the traced markings on the white fondant. Gently press the pen marking on the fondant. 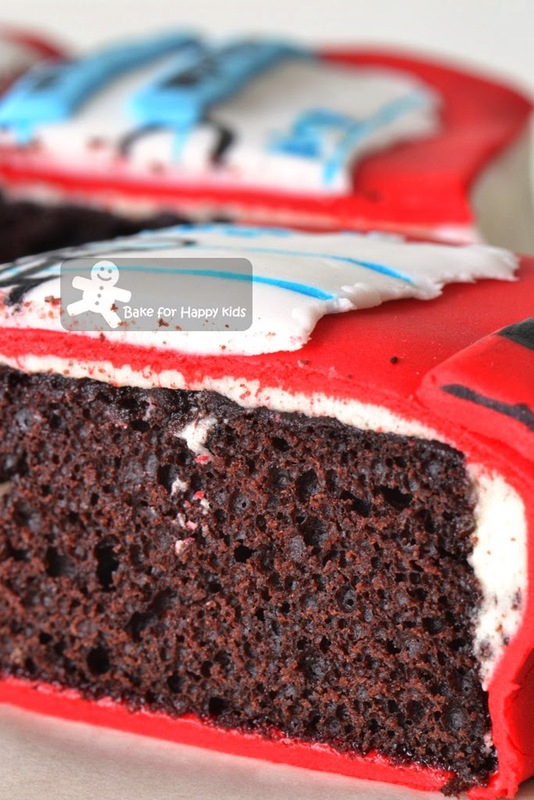 Using a black edible pen, trace the marking on the fondant to replicate the wimpy kid picture on the fondant. Tear the edges of the fondant to create rough paper edges and place the fondant below the title. Roll a red strip of red fondant, 3 x 20 cm and place it on the left side being the spine of the book. Using a black edible pen, write thick stripes like the shapes of a book spine. Roll out two thin strips of blue fondant and place them next the wimpy kid picture. 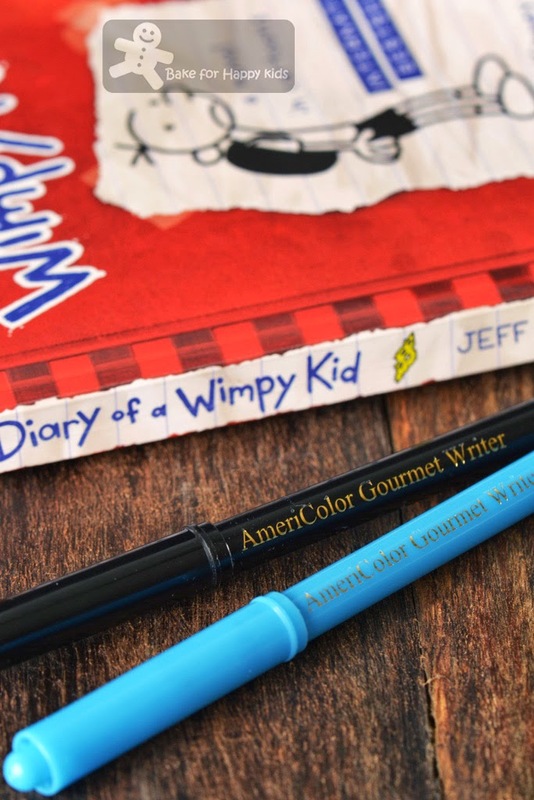 Using black edible pen, write the words "International Bestseller" on them. 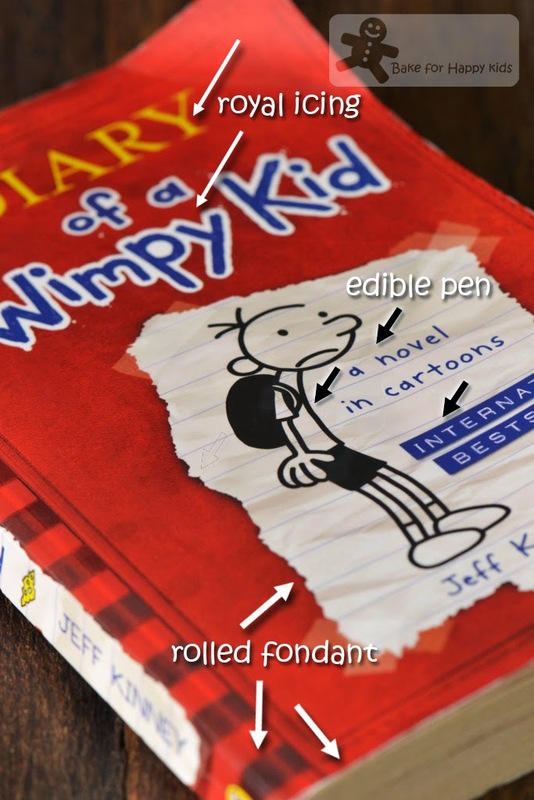 Finally, use a blue edible pen and write "a novel in cartoons" and "Jeff Kinney" on the pictures to finish. 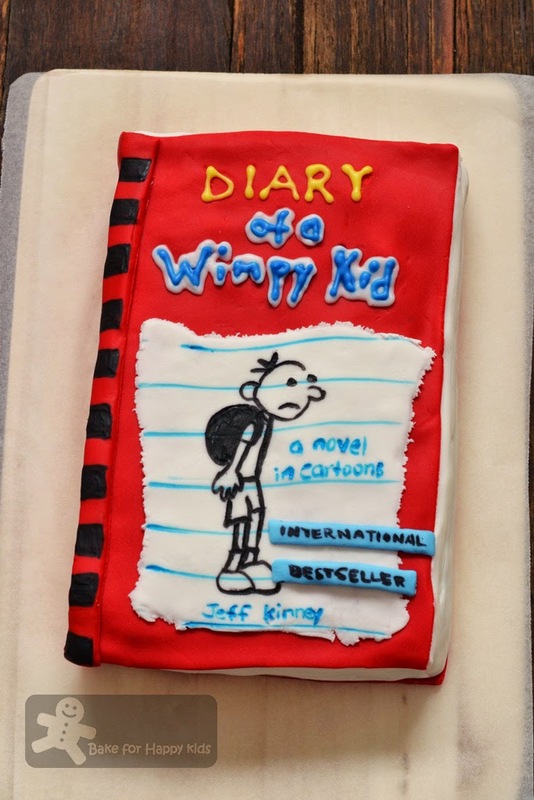 Here, you have a Diary of a Wimpy Kid cake! OMG crazy woman !! I really thought that was a book instead of a cake, until I read the middle part where you described edible pen, fondant and all.. Gawd, you are amazing Zoe.. I have seen the whole set of Diary Of A Wimpy Kid at online book stores, but I bought the Peter & Jane collection first.. 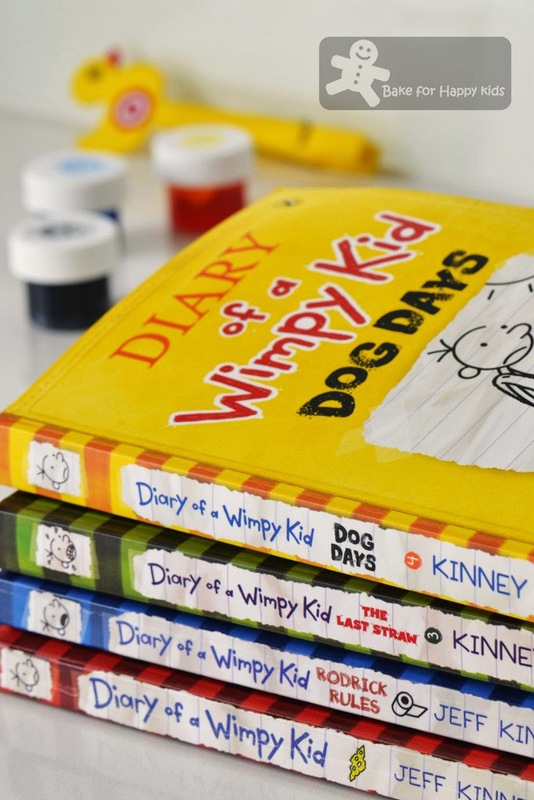 Considering to buy this Wimpy Kid set later when he's bigger..
My son had these when he was young and he loved it so much. Your boy is fast. My son only started reading these in Primary 1. This is a very special Whimpy Kid cake!! Hi, Zoe. 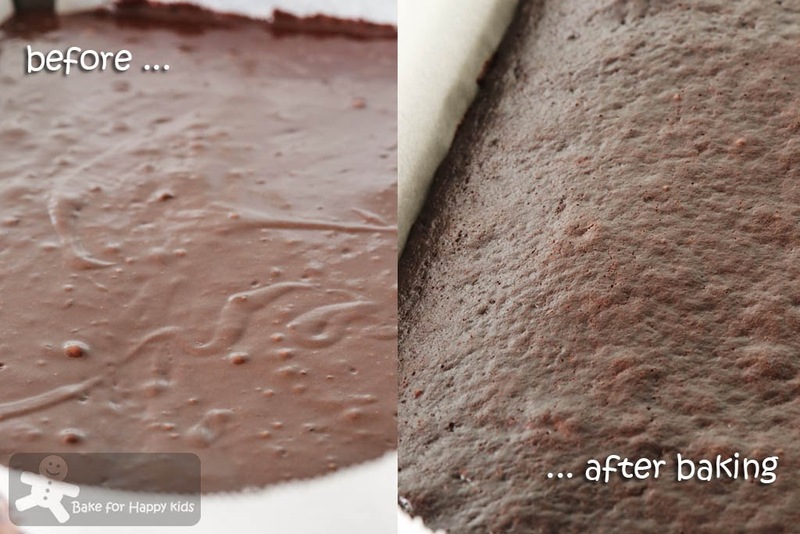 At first look, I didn't notice your photo of the cake. I thought that is a real book. I am sure your son loves the cake and loves you, too! Im in astonish looking at your edible birthday book. It so real! Your son must be beaming with wide eyes and smile when he look at his favourite book, right? And it is chocolate flavour too...mmm...delicious. Happy birthday kiddo! Hope you will grow up to be cheerful and healthy. Be a good boy. Such a nice cake...and you sure did a great job decorating it. my goodness , love that cake!!! Amazing, it really does look like the book! Happy Birthday to your little one! OMG… this is fabulous looking cake. I can imagine all the love poured into making and baking the cake. Oh my goodness, what a lucky boy!! This cake is fantastic, I love it! Zoe, I salute you! Your cake really looks like a book! Happy Birthday to your boy and he knows he is a very lucky boy indeed! Omg! Unreal! I was like ok ok, where's the cake where's the cake ... Then scrolled all the way down and then back up again! Now ur boy can read the book AND eat it!!! He's only 5 and he's reading that book. He's a bright kid. Happy birthday to your little man! Wow! Your cake looks real ! At first I can't locate your cake photo as what I saw is a 'book'. Happy Birthday to your boy! That is a cake?! It looks just unbelievable! The cake looks so amazing. Birthday wishes to your boy. If you have seen the movie, the Indian boy in there is my first cousin Karan Brar. Zoe, Happy Birthday to your boy. He is a bright boy to read wimpy kid at 5. He deserves the wimpy kid cake:)) and you are a super mum! Zoe, this cake is fantastic!! My boy love Wimpy Kid books too, they are great books for this age! WOW!!! ...firstly... HAPPY BIRTHDAY TO YOUR SON! That is one stunning cake! Looks like the real book! I really admire your creativity and artistic talent in cake decorating! I am still chicken to even start thinking about handling fondant! Great job, Zoe! The cake is beautifully done! The cake looks out of this world! 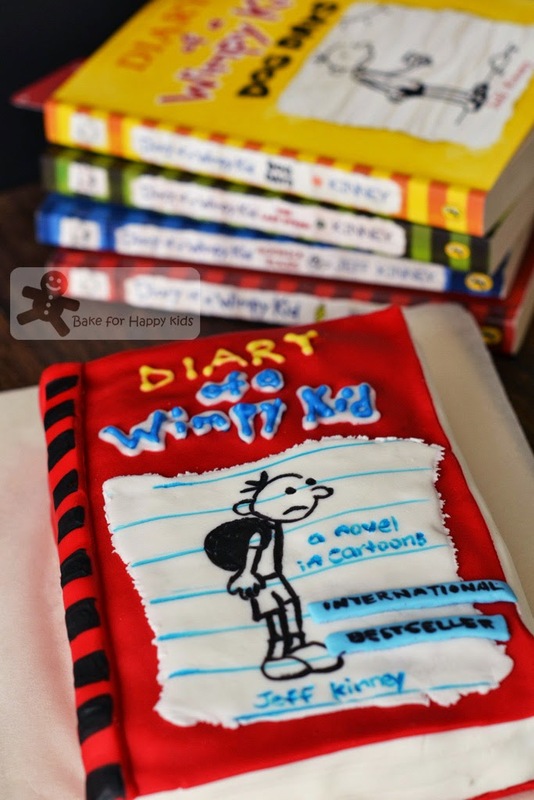 Really good idea carving a book out of the cake..
Diary of a Wimpy Kid is one of my most favorite movie series! Simply loved it! Happy birthday to your boy and wat a stunning cake, lucky boy and ur birthday cake is just breath taking. Love it. Wonderful job. And a great series to read, as well. Funny stuff. This is so cute!!!! I love it! awesome..i love your cake zoo much.. Happy birthday to your boy, Zoe! oh my, your cake is a real work of art! Love it! This is simply amazing!!! Happy Birthday to your son. Of course, your cake is simply amazing! I usually have much success with Martha Stewart's recipes. She may be distant but her recipes are usually "spot on." Wow! Amazing job you did there Zoe, it's so meticulous! I wish I have half your patience lol! The sheet cake look fluffy and soft. Zoe, so sorry for the late birthday wish to your little man! Happy belated birthday! Isabelle is 1 year younger than your boy and she only likes to read books related to Angelina Ballerina, Hello Kitty & Peppa Pig(Oink Oink), hehe. This is a beautiful chocolate birthday cake! The birthday boy must be very excited! Hi Zoe, I'm very impressed with your masterpiece ... really really so beautiful ... that I wouldn't bear to eat it. Happy belated birthday to your boy.